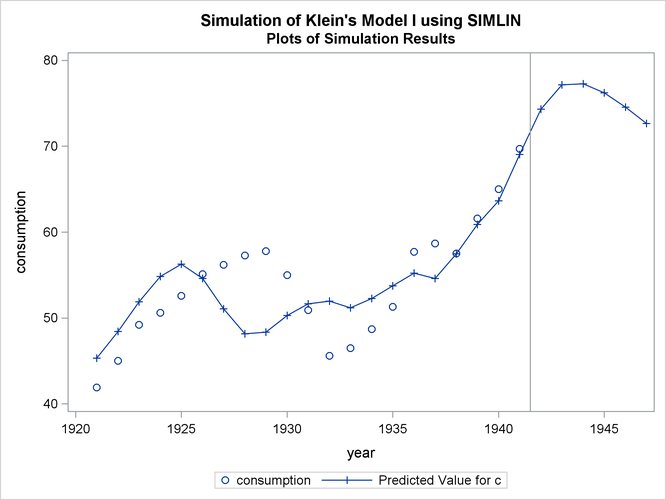 In this example, the SIMLIN procedure simulates a model of the U.S. economy called Klein’s Model I. The SAS data set KLEIN is used as input to the SYSLIN and SIMLIN procedures. 1920     . 12.7     .    .  44.9    .     .     .  182.8     . First, the model is specified and estimated using the SYSLIN procedure, and the parameter estimates are written to an OUTEST= data set. The printed output produced by the SYSLIN procedure is not shown here; see Example 29.1 in Chapter 29 for the printed output of the PROC SYSLIN step. The OUTEST= data set A created by the SYSLIN procedure contains parameter estimates to be used by the SIMLIN procedure. The OUTEST= data set is shown in Output 25.1.1. INST 0 Converged FIRST c 2.11403 58.3018 -0.14654 0.74803 0.23007 0.19327 0.20501 -0.36573 0.70109 -1 . . . . . . .
INST 0 Converged FIRST p 2.18298 50.3844 -0.21610 0.80250 0.02200 -0.07961 0.43902 -0.92310 0.31941 . -1.00000 . . . . . .
INST 0 Converged FIRST w 1.75427 43.4356 -0.12295 0.87192 0.09533 -0.44373 0.86622 -0.60415 0.71358 . . -1 . . . . .
INST 0 Converged FIRST i 1.72376 35.5182 -0.19251 0.92639 -0.11274 -0.71661 0.10023 -0.16152 0.33190 . . . -1 . . . .
INST 0 Converged FIRST x 3.77347 93.8200 -0.33906 1.67442 0.11733 -0.52334 1.30524 -0.52725 1.03299 . . . . -1.00000 . . .
INST 0 Converged FIRST wsum 1.75427 43.4356 -0.12295 0.87192 0.09533 0.55627 0.86622 -0.60415 0.71358 . . . . . -1.00000 . .
INST 0 Converged FIRST k 1.72376 35.5182 0.80749 0.92639 -0.11274 -0.71661 0.10023 -0.16152 0.33190 . . . . . . -1 . 3SLS 0 Converged CONSUME c 1.04956 16.4408 . 0.16314 . . . . . -1 0.12489 . . . 0.79008 . .
3SLS 0 Converged INVEST i 1.60796 28.1778 -0.19485 0.75572 . . . . . . -0.01308 . -1 . . . .
3SLS 0 Converged LABOR w 0.80149 1.7972 . . 0.18129 . . . 0.14967 . . -1 . 0.40049 . . . IDENTITY 0 Converged PRODUCT x . 0.0000 . . . . 1.00000 . . 1 . . 1 -1.00000 . . . IDENTITY 0 Converged PROFIT p . 0.0000 . . . . . -1.00000 . . -1.00000 -1 . 1.00000 . . . IDENTITY 0 Converged STOCK k . 0.0000 1.00000 . . . . . . . . . 1 . . -1 . IDENTITY 0 Converged WAGE wsum . 0.0000 . . . 1.00000 . . . . . 1 . . -1.00000 . . Using the OUTEST= data set A produced by the SYSLIN procedure, the SIMLIN procedure can now compute the reduced form and simulate the model. The following statements perform the simulation. The reduced form coefficients and multipliers are added to the information read from EST= data set A and written to the OUTEST= data set B. The predicted and residual values from the simulation are written to the OUT= data set C specified in the OUTPUT statement. The SIMLIN procedure first prints the structural coefficient matrices read from the EST= data set, as shown in Output 25.1.2 through Output 25.1.4. 1.0000 -0.1249 . . . -0.7901 . .
. 0.0131 . 1.0000 . . . .
. . 1.0000 . -0.4005 . . .
-1.0000 . . -1.0000 1.0000 . . .
. 1.0000 1.0000 . -1.0000 . . .
. . . -1.0000 . . 1.0000 .
. . -1.0000 . . 1.0000 . . The SIMLIN procedure then prints the inverse of the endogenous variables coefficient matrix, as shown in Output 25.1.5. The SIMLIN procedure next prints the reduced form coefficient matrices, as shown in Output 25.1.6. The multiplier matrices (requested by the INTERIM=2 and TOTAL options) are printed next, as shown in Output 25.1.7 and Output 25.1.8. The last part of the SIMLIN procedure output is a table of statistics of fit for the simulation, as shown in Output 25.1.9. The OUTEST= output data set contains all the observations read from the EST= data set, and in addition contains observations for the reduced form and multiplier matrices. The following statements produce a partial listing of the OUTEST= data set, as shown in Output 25.1.10. The actual and predicted values for the variable C are plotted in Output 25.1.11.